The following concepts describe how you can improve your stove in terms of efficiency. There are different aspects which will be analyzed because one can do more than just insulate the combustion chamber. In the picture below an example of an efficient stove is shown. The most fuel efficient heating stove is one that is never used! Therefore it is most important to reduce uncontrolled air exchanges by filling cracks in the walls, around windows and doors and secondarily to insulate the house. A house that is relatively airtight and insulated like a thermos bottle or a box full of hay does not require constantly burning wood in a stove to maintain interior temperatures. Cutting wood up into smaller pieces and feeding them at a proper rate into the fire as they are consumed. 2) Making a hot fire. Creating a combustion zone where fuel, flame and air are mixed by turbulence, at a high enough temperature, for a long enough time to completely combust. Combustion temperatures must be hot enough to assist burning all escaping gases released from the wood. 3) Insulating the combustion chamber. Insulation helps to keep temperatures high. Passing smoke, which is un- combusted fuel, through a flame. Starving the fire slows it, cools it down, and produces smoke. 6) Warming and increasing the velocity of the cold air entering the fire. Air is warmed as it passes through a small opening into the combustion chamber. For systems without a fan, make enough small holes under the door into the combustion chamber so the holes have as much cross-sectional area as the chimney exiting the stove. Position the holes so that primary air is sucked into the coals and up into the combusting wood. Do not allow the user to block the holes reducing primary air. Blocking the necessary amount of air will create pollution. The rate of burn in a heating stove should be determined by the amount of fuel in the combustion chamber, not by shutting off air to the fire. 7) Forming a grate out of the firewood. Sticks burning close together heat each other and keep the temperatures high. The pattern should be stick, air, stick, air, with even spaces between the sticks. Use a tall enough chimney or better yet a small fan. An insulated chimney creates a lot more draft than an un- insulated chimney. High velocity, low volume jets of hot air entering under the fire, up though the coals, create mixing which reduces emissions. Do not use a damper in the chimney. Design the stove to run efficiently with enough air entering and leaving the stove to burn fuel cleanly. Complete combustion cannot occur when starting a stove because the combustion chamber is too cold. An insulated combustion chamber will heat up more quickly and then, when burning metered amounts of biomass, make less smoke. Throwing a big log on the fire, however, always makes smoke. The log cools the fire and releases more pyrolysis gasses that overwhelm the available air and are too cold to be combusted. Without enough air, wood cannot burn cleanly. The size of the air inlets into the fire should add up to be about as large as the chimney exiting the stove. The power level of the stove should be set by the wood loading rate, not the air flow. When users try to control the power of the stove by shutting off air to the fire they can send horrible plumes of smoke out of the chimney. A stove must have enough air to function efficiently. Metering fuel makes clean burning easy. In a regular wood burning stove, the same thing can be accomplished by burning small pieces of dry wood and watching to make sure that a fierce flame is present. A little observation teaches the operator quickly how to maintain clean burning. Unfortunately, adding fuel at regular intervals is much more demanding and time consuming than just throwing a log onto the fire and then ignoring the smoke polluting the environment. Insulative ceramics used in stoves undergo repeated heating and cooling (thermal cycling), which may eventually produce tiny cracks that cause the material to crumble or break. All of these recipes seem to hold up well to thermal cycling. The only true test, however, is to install them in a stove and use them for a long period of time under actual cooking conditions. If you can afford it, buying commercial fire brick is certainly an easy and workable option. Insulative ceramics need to be lightweight (low-density) to provide insulation and low thermal mass. At the same time, they need to be physically durable to resist breakage and abrasion due to wood being forced into the back of the stove. These two requirements are in opposition; adding more filler to the mix will make the brick lighter and more insulative, but will also make it weaker. Adding clay will usually increase strength but makes the brick heavier. A good compromise is achieved in a brick having a density between 0.8 gm/cc and 0.4 gm / cc. These recipes described below are a starting point for making insulative ceramics. Variations in locally available clays and fillers will probably require adjusting these proportions to obtain the most desirable results. In this formulation, fine sawdust was obtained by running coarse sawdust (from a construction site) through a #8 (2.36-mm) screen. Clay was added to the water and mixed by hand to form thick mud. Sawdust was then added, and the resulting material was pressed into rectangular molds. Excellent insulative ceramics can be made using sawdust or other fine organic materials such as ground coconut husks or horse manure. The problem with this method is obtaining large volumes of suitable material for a commercial operation. Crop residues can be very difficult to break down into particles small enough to use in brick making. This method would be a good approach in locations where there are sawmills or woodworking shops that produce large amounts of waste sawdust. In this formulation, raw charcoal (not briquettes) was reduced to a fine powder using a hammer and grinder. The resulting powder was passed through a #8 screen. Clay was hand- Charcoal/clay bricks tend to shrink more than other materials during both drying and firing. The final product seems to be lightweight and fairly durable, although full tests have not yet been run on this material. -like structure of vermiculite particles makes them both strong and very resistant to heat. Vermiculite appears to be one of the best possible choices for making insulative ceramics. --firing will cause the pumice particles to shrink and turn red, resulting in an inferior product. Despite these concerns, pumice provides a great opportunity to supply large numbers of very inexpensive insulative ceramics in many areas of the world. The great thing about air-to-mass heat exchangers and air-to-water systems is that the stove can be fired very hot for a long time without overheating the room. The heat goes into the cool stone or water, instead of immediately into the room air. Big fires are very hot and for that reason can produce less harmful emissions. The harmful gasses burn up in the hot fire. 1. The mass stores heat that can keep the house warm overnight. 2. Gentle radiant heat feels good. 3. Burning time can be reduced. 1. Stored heat is there if you need it or not. If the day suddenly gets warmer, the room can overheat. 2. The mass takes up room. To store sufficient heat, the heat exchanger must weigh thousands of pounds. 3. The cold mass will take a long time to heat up and warm the room. Coming home and lighting the stove for warmth will not work with a high-mass, slow-response heating stove. The stove needs to be kept warm. 4. Creating the ductwork in stone, brick, or adobe frequently requires experience. A stove using a high-mass heat exchanger can get away with short hot burns. An air-to-air heating stove has a harder task to accomplish: to create an equally hot, smaller fire that matches the heating demand of the space. The air-to--to-air solutions is that they can be built inexpensively and quickly. 1. It is inexpensive and easy to make. 3. It takes up less space. 4. It heats the room quickly. 5. If the weather suddenly warms, the heat can be adjusted. 2. It discourages big, hot, clean-burning fires (which overheat the room) and can encourage small fires that pollute. 3. It is better suited to less drafty houses. Air-to-water heat exchangers for house heating seem so full of potential problems. Imagine trying to repair lots of leaking pipes buried in your floor. So far, potential difficulties and cost have steered back to simpler solutions. Heating water is theoretically a great idea but can be complicated. 4. Minerals in water can reduce internal pipe diameter, leading to reduced water flow, greater temperature rise and increased pressure loss in the system. Even in an optimized design, a heat exchanger requires a lot of surface area. Just piling mass near a stove will result in poor heat transfer to the mass. Only a small percentage of the heat will end up in the mass. 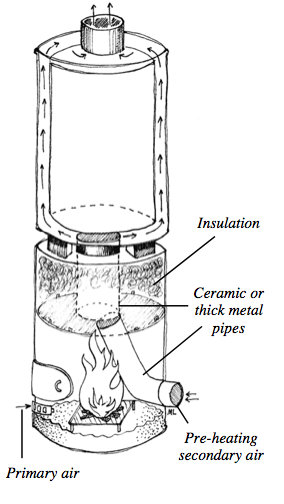 Hot flue gasses need to be forced to scrape against surfaces over long distances for efficient heat transfer to occur. 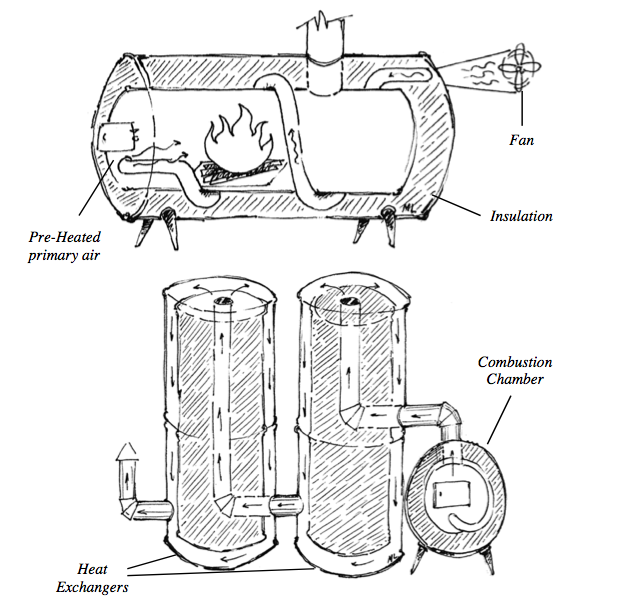 Fans are great because primary air (the air entering the fire) can be preheated, which greatly improves combustion (see the very first picture on this article). Forced air helps the coals to burn down completely, leaving only a bit of ash. The rush of low- volume high- velocity jets of hot air do a great job mixing fuel, air, and fire which clean up combustion. A fan can also push air through such a long length of heat exchangers that close to 100% of the heat stays in the room. Doubling heat transfer efficiency can double fuel efficiency. Fans make everything easy. One reason is that if air is preheated and blown into the combustion chamber temperatures can rise to the point where steel begins to melt. Blowing preheated air into a big fire creates a blast furnace. Also, being dependent on a fan means that stoves may not work correctly when most needed, like during a winter storm when the electricity fails. Some people dislike the whirring of fans, preferring the silence of natural draft. However, when fuel efficiency is the highest priority, the amount of electricity used by the fan is very small when compared to the benefit received. If preheated air is used, the combustion chamber needs to be made from stone or high-temperature ceramic, refractory bricks, or refractory cement. This page was last edited on 27 February 2010, at 23:53.